Sprinkle each side of chicken with Italian seasoning, salt and pepper. In large skillet over medium high heat melt butter with olive oil. Add onion and garlic and saute for about 2 minutes. Move onions and garlic to side of pan and add seasoned chicken. Saute for about 2-3 minutes on each side until nicely browned. Stir chicken, onions and garlic together then transfer to the crock pot. Add chicken broth. Cover and cook on low for 5-6 hours or high for 3-4 hours. Remove chicken and cover to keep warm. Add cream, mustard and lemon juice to crock pot and whisk. To thicken sauce whisk in 1 tablespoon cornstarch. Continue to stir until thickened. Add additional salt and pepper to taste. 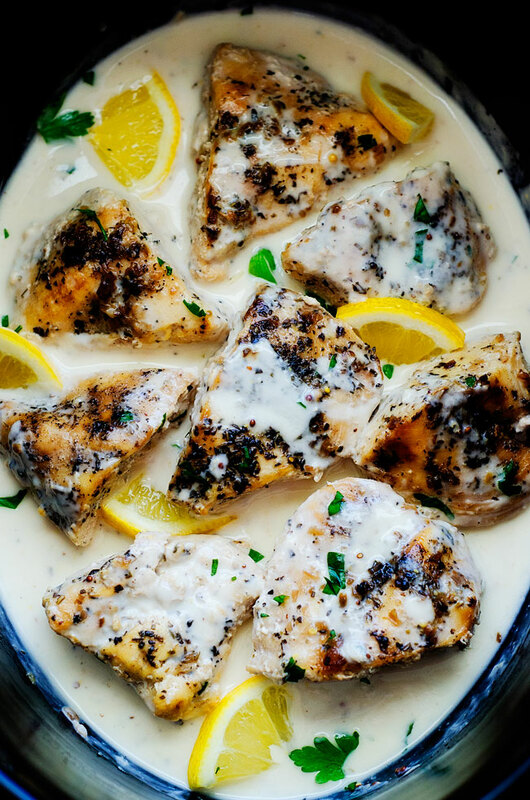 Pour creamy lemon sauce over chicken then serve. Enjoy!